Usually when people talk about junk in your trunk, they aren't talking about car audio. But if you don't do your research and make an informed decision when choosing your car audio products, you could be putting junk in your trunk without even knowing it. Amplifier power ratings in RMS, Max, and Peak could be the most misunderstood specifications in car audio. 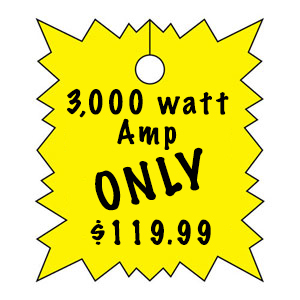 Some of you may need to brace yourself for some bad news… That 3,000-watt amp you bought from a department store for $119.99… It doesn’t really have 3,000-watts of power output. Unfortunately, some less than reputable manufacturers confuse car audio customers into believing their amplifiers can provide more power than they are capable of. They build an inferior product and in order to sell it, they simply claim it will make more power than it really does. False advertising right? Well, they get away with it. It’s shady marketing and if you read through the fine print of the owner's manual (if it has one), the manufacturer will publish an RMS power rating for the amplifier. These Max power numbers are unrealistic and would only be attainable for a fraction of a second and only if the stars and the moon were to align in just the right formation and the amplifier were to be struck by a bolt of lightning at the exact same time This is commonly referred to as a “WLS rating.” WLS = When Lightning Strikes. The Consumer Electronics Association (CEA) has tried to help with this problem by creating a standard so that all amplifiers are rated under the same criteria. However, not all manufacturers are compliant and most people wouldn’t know which manufacturers are so standardizing the way amplifiers ratings are calculated hasn't always solved the issue. There are still manufacturers out there that focus on Peak power ratings instead of RMS power ratings. RMS = root mean square. The mathematical definition is the root mean square of the AC voltage or current. All this means is the RMS rating is the continuous average power you can expect from the amplifier and therefore should be the number you focus on when researching an amplifier. Peak power refers to the maximum level of power output that an electronic component can handle without damage for a short period of time. This means an amplifier could possibly output 1,000-watts for 1 second before it would fry. So the peak power rating could be 1,000-watts. Most of us want our amplifier to last longer than 1 second. Max power ratings are even more unreliable and useless. Max power ratings basically have no standard and are completely and entirely made up for marketing purposes to make a product look good on the shelf. An easy way to tell if the power ratings are realistic or not is to add up the value of the fuses in the amplifier and multiply that by 14.4 volts which is the standard voltage an automotive battery is supposed to have when connected to an alternator. This calculation will tell you how much power the amplifier could output when it is receiving the maximum power from your vehicle’s electrical system. For example, if an amplifier has a single 40-amp fuse, you would multiply 40 by 14.4 to get 576-watts. If the amplifier is claiming significantly more Peak/Max power than that, you know it’s probably bogus. As you can see, the manufacturer claims 650-watts of RMS outputs at 4-ohms and 1,500-watts of RMS output at 2-ohms. Yet they still advertise this as a 3,000-watt amplifier. Then we dig a little deeper and we find out that the amplifier only has a single 40-amp fuse. Given the math above, we know this amp’s maximum output would be 576-watts in the best possible scenario with 14.4 volts from a vehicle’s electrical system. In the owner’s manual, the fuse values are not shown on any of the diagrams. It isn’t until page 18 of a 19 page manual that they specify the fuse quantity and value of the amplifier. In this case, the owner’s manuals RMS power ratings don’t even match the RMS power ratings on their website. One claims 1,000-watts @ 4-ohms and the other claims 650-watts @ 4-ohms. Another feature to look for is the size of the power and ground terminals. If the amplifier claims it can do a lot of power but only has 4 or 8 gauge power and ground terminals, the power ratings are inflated. High power amplifiers require a lot of current from your battery and 4 and 8 gauge wire cannot deliver the necessary current. 1/0 gauge terminals are generally used in amplifiers that have a legitimate 2,000-watts of power output or more. It’s a pretty logical concept. The larger the wire, the more current it’s capable of carrying. In our supposed 3,000-watt amplifier example mentioned above, the power and ground terminal sizes are not mentioned anywhere until we read the owner’s manual. They don’t refer to their size anywhere on the diagrams, but the size is buried in text. In the most confusing way possible, the manufacturer recommends 4 or 8 gauge wire for power and ground. 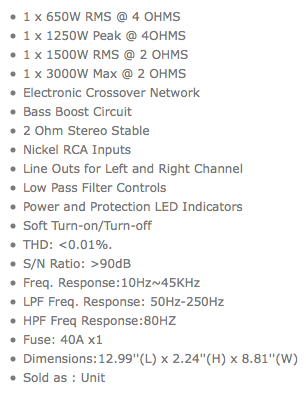 Based on all of this information, we know this amplifier is really only capable of around 576-watts Max/Peak. Assuming the standard 50% less power for RMS ratings, the 3,000-watt amplifier as advertised really only has around 300-watts of RMS output. And given our $0.40 per watt standard, that’s just about right on target. It might even have less RMS power output! The MTX XTHUNDER1500.1 amplifier has three 40-amp fuses for a total fuse value of 120-amps. 120 x 14.4 = 1,728-watts, which matches its rated power of 1,500-watts RMS at 1-ohm. MTX Audio amplifiers have a reputation for being underrated because we rate our amps for real world applications. We don’t exaggerate them and sometimes, we even exceed them giving our customers more bang for their buck. Literally! When comparing amplifiers, the RMS rating is the only rating that matters when it comes to power output. Less than reputable companies can also tweak the RMS ratings in their favor or publish an inflated range of RMS power, but RMS ratings are the most reliable of the three. Generally speaking, amplifiers sell for between $0.40 and $0.50 per watt at their highest RMS rating. For example, a 1000-watt RMS @ 1-ohm amplifier will sell for around $400 or $500. If you see an amplifier advertised as a 3,000 watt amplifier that is selling for less than $1,000, you should have sirens blaring in your head with red flags waving and flashing lights everywhere! Don’t be fooled by exaggerated Peak or Max power ratings! When matching an amplifier to subwoofers, it is important to use the RMS ratings at the final impedance of your subwoofer wiring plan. If you plan on using two dual 4-ohm voice coil subwoofers in your system, you can wire them to a final impedance of 1-ohm or 4-ohms. In order to ensure you get the appropriate amount of power from the amplifier’s RMS rating, you MUST wire your subwoofers to that impedance. For example, if your amplifier has an RMS rating of 1,000-watts x 1 channel @ 1-ohm, 600-watts x 1 @ 2-ohms, or 350-watts x 1 @ 4-ohms and your two subwoofers have an RMS power handling of 500-watts each, you would want 1,000-watts of RMS power output from your amplifier which means you would have to wire your subwoofers to a final impedance of 1-ohm in order to get 1,000-watts. For more information on matching subwoofers with amplifiers, read our article on Subwoofer Impedance. If you need help with the possible wiring configurations and final impedances of your subwoofer combination, visit Subwoofer Wiring Diagrams. Step #2 – Add up the RMS power handling of each of your subwoofers to get a total RMS power needed. Step #3 – Find an amplifier that will offer the total amount of RMS power needed at the final impedance you can wire your subwoofers to. Step #2 – Find a subwoofer combination and multiply the RMS power handling of the subwoofer by the quantity of subwoofers you want and match that number to the RMS rating of your amplifier. Step #3 – Ensure that the voice coil configuration of the subwoofers you choose will allow you to wire them to the appropriate final impedance at which the amplifier will provide the correct amount of power output determined in Step #2. Do as much research as you can on your own to determine the realistic RMS power output of an amplifier based on what you have just read in this article. Then, if you want to test the honesty of a person trying to sell you on an amplifier, ask him if the ratings are realistic… That’s always an interesting conversation even if you already know the answer.